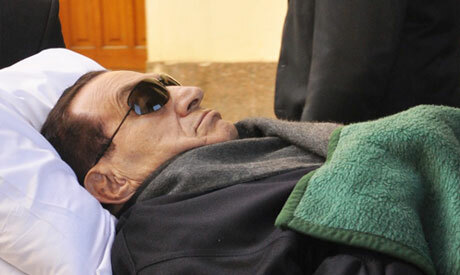 Mubarak being wheeled into courtroom. This is day he really died. This is day the world saw him in a cage. Mubarak lives. He doesn’t live. What is living? Heart beats while brain is dead. Machines keep his body functioning. At best, he’s in a coma. Is there a parallel here with democracy in Egypt? That doesn’t keep me from being heartsick. We were warned. All the “Old farts” and pundits said it from the beginning. The Muslim Brotherhood and the Military (SCAF) – the future of Egypt would come down to a battle between those two forces. And so it has. Now the MB (Muslim Brotherhood) did go through a period of intenseÂ counter-propagandaÂ to convince the world – and Egyptians, I guess – that they weren’t interested in political power. I wanted to believe them. Everyone did. But of course, they were lying. Like all effective politicians, they told a few lies to fool the fools. Just like predicted, they were the best organized group going into the revolution, and thus the best organized going into elections. And they won Parliament. Next came the Presidency. One by one the candidates committed to a secular andÂ progressiveÂ Egypt fell away. Didn’t have the guts to continue – or didn’t have the support. The youth who started the revolution in the first place never got themselves organized to run their own candidates. I’ll never quite understand exactly where it all went wrong. Mahamed Mursi, Muslim Brotherhood's candidate and probably winner of Egypt's first presidential election. But it did go wrong. Terribly wrong. At least, in my opinion. When the final two candidates emerged, the Egyptian people had a choice between Mubarak-eraÂ prime minister and former air force commander Ahmed Shafiq and Muslim Brotherhood’s enforcer Mohamed Mursi. Conveniently soon after early indicators of the election pointed to the MB’s Mursi as the winner, the High Constitutional Court rendered a verdict declaring the results of the parliamentary election illegal. The military (SCAF) dissolved Parliament. Next step was the edict of the military proclaiming that the newly elected President – results not to be released until this weekend – will not hold office long and will have virtually no power. SCAF (military) has appointed a committee of 100 to write a constitution which is predicted to render null and void the Presidential election. It’s truly a coup. Anyone can see it. And I should be outraged. I AM outraged. But strangely enough, I am also a little relieved. Don’t get me wrong. I don’t like the military. They arrest people and do terrible things to them and generally stand above – way above – the Law. But I don’t like the Muslim Brotherhood either. Field Marshall Hussein Tantawi of SCAF - the Egyptian military in control of Egyptian government since Mubarak's resignation. 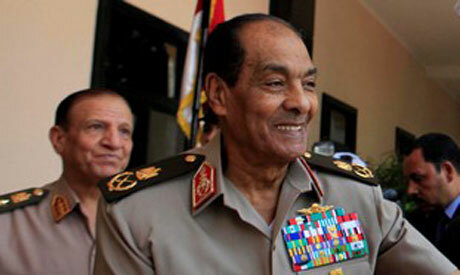 SCAF has a clear intention – not to allow the Islamists to take over Egypt. I don’t want the Islamists to take over Egypt. So I find myself in a strange camp with the enemy of my enemy who is also my enemy. How dreadful for the Egyptian youth who gave so much to bring about a change that turns out not to be a change at all. But like I said, I’m not Egyptian. So I don’t really have the right to an opinion. I’m expressing it anyway, because this is bigger than Egypt. This is the fear that so many had who refused to support the Libyan revolution against Gaddafi. Who don’t want to get involved – really involved – in Syria. If an Islamic government unfriendly to the West and contra-progressive in terms of women’s and religious rights is the inevitable outcome of the Arab Spring, then who can blame the sceptics for their lack of enthusiasm? So Egyptian democracy has had a major stroke. It’s in a coma that looks like it’s leading to death. I hate it when the naysayers are right. I SO wanted them to be wrong. Please take a look at the websites we comply with, including this a single, because it represents our picks in the web…. Sandra, thank you for your interest in the Arab world and thanks for you genuine feelings towards the Arab spring. I will try and give a background from an Egyptian woman’s perspective. The Arab spring in Egypt started by the young men and women of the middle class and upper middle class and even of affluent families. I am sorry if I am repeating it, because I am sure the whole world knows it as an established fact. My son is one of them. When it started its sole demand was “justice, freedom, dignity, and bread.” It toppled a regime of 30 years. A regime that didn’t care for its people but cared for making the rich richer but the poor poorer. For 18 days the revolutionary spirit hovered all over Egypt, Muslims and Christians were one fighting and struggling against the old regime. Young women and men threw stones one day and cleaned their mess in the streets the next (please check today’s NY Times article on Egypt and see the picture of Tahrir, what state it’s in and compare it with the one of Jan 25, 2011). In January 2011, young men defended their streets and homes with baseball bats, because the prison doors got open and prisoners and thugs went at large. By the way, one of the prisoners who escaped is Mursi, who happens to be the candidate running for presidency. Mind you he could have been detained for some political reason. I have nothing against him personally. I just don’t like MB as an organization (although it is a fact that they are the best organized in the country- well they have been organizing themselves and working underground for 80 years now). Yet no one trusts them and this is exactly what I told my son at the beginning of the revolution, when my son and his friends praised them and even said poetry about them. My husband and I kept on telling him that they were not to be trusted. They can back-stab you in a second once it is in their interest (and they actually did, when they back-stabbed the revolutionaries in Mohamed Mahmoud and even called them thugs in the parliament and sided with the police and SCAF, and more). At that time in Jan 2011, my son and his friends as usual called us old generation and went on believing in them and repeated that the MB youth are different. FYI, the revolution didn’t start at the hands of MB. It was started by liberal Egyptians, Christian and Muslim. MB joined much later they were not in the scene not even on the tragic day of Jan 28. So many times they were asked to join but they kept lagging behind to weigh the revolution and see how to use it. Anyway, the revolution succeeded and Mubarak left. MB played all roles to control and they succeeded. In March 2011 there was a referendum whether firs the constitution be drafted, or the old constitution is used with some amendments and parliamentary elections, and the members of the parliaments draft the constitution then. All the educated and liberals said constitution first. But MB wanted the second choice: old constitution with some amendment and parliamentary elections first. MB bought the poor. There are a lot of Egyptians who are below the poverty line, which means less than 2 dollars a month??? almost 40% if not more. Many are illiterate. They were bought by money, tea, sugar and oil (cooking oil). Yes they were bought by such goods. It is well known. So the referendum came with the answer for parliamentary elections first and some changes to the old constitution. Also the constitution be drafted by the parliament. This of course pleased the MB. They also added a certain decree in the same March referendum which allows the Supreme Electoral Presidential Committee’s (SEPC) full control over the results of the elections. It states that the ruling on all elections should not be questioned what so ever. And of course MB with the backing of SCAF won the majority along the Salafists (Nour Party). Liberals at that time said OK let us give them a chance. People realized the true colors of MB and that all they care about is power and the control of the country. That’s why a lot didn’t vote for MB in the first round of the presidential elections unlike the elections of the parliament. The reason why the other candidates, the ones supported by the revolutionaries didn’t win is not because they didn’t do well, it is because SEPC decided that the second round is going to be between the top two. Each got 5 million, and the candidates of the revolutionaries got around 11 million. The problem with the candidates of the revolutionaries, is that they didn’t unite and each went on his own and so the votes were spread among more than 10. SEPC as mentioned above is backed by a law of March referendum that its decision and ruling should not be questioned at all and so it decided on the first two (Shafiq and Mursi MB). So Egyptians found themselves between two candidates, one represented the old regime but promised to work with the youth, have a Copt (christian) and a woman as a vice presidents and bring stability back to the country (a dream all Egyptians and I am one of those who long for)and is liberal. And another who wants to rule by religion and wants to bring the country to the middle ages. There was a saying on Facebook and Twitter, which says: “go with Shafiq you will be able to change him in 4 years, but don’t go with Mursi because you will never be able to change him not even in 100 years”. Mursi representing MB rule by religion and they were saying during their campaign that those who don’t support Mursi are against Islam and God. Educated Egyptians want their freedom, they don’t want to be like Iran. Now, some revolutionaries either because of fear, revenge or dislike of Shafiq supported Mursi and went and voted for him. There are two scenarios, some of them say they will be able to topple Mursi just like Mubarak (which I am very skeptical of) others say let them have power and come out in the open so people see their real colors, like what happened in Alexandria (second city in Egypt) whose people turned their backs to MB and that’s why they supported Sabbahi the revolutionary candidate. But in my modest view, I think MB are not to be trusted at all. All they care about is their organization. They have their Supreme Guide whom they pay allegiance to obey whatever he asks. Their allegiance is not to the country. There is a rumor that Qatar is backing them and that MB may rent Suez Canal to be run by Qatar for 99 years. All this of course infuriates Egyptians. They are very nationalistic and don’t like any kind of such deals. So the masses move towards Shafiq. SPEC says that the reason of the delay (results should have been out last Thursday) is that they are looking into the appeals by both candidates. There are around 300+ appeals. For example in Asyuut (a province in upper Egypt) some people were prevented from voting. Asyuut is known to have a big population of Copts (Christians). Other appeals include the charges that some ballots were already marked before the elections started and may have been already distributed among the election stations. So in sum, SPEC is saying that it is doing its job, counting and recounting and that’s why the delay. However, the delay is working for SCAF. Some believe that the delay is because of forcing MB to accept the annex to the preliminary constitution that SCAF came up with just in the last couple of days. According to SCAF, they did so because the parliament did not come up with any thing concerning the constitution during its tenure and, therefore, the circumstances forced SCAF to take such action. The parliament got also disbanded -to the joy of all Egyptians- not by SCAF, but by a judiciary ruling because the parliament election law was flawed. 1/3 of the parliament is controlled by parties instead of it being controlled by independents as stated by the law. The flawed election made MB and Nour (salafists) have the most seats. Therefore, people were very happy that it got dissolved. At this point and two days before the presidential elections SCAF decided the sequence be in this way: presidential elections, then the draft of the constitution, and then elections of the new parliament. SCAF also in its annex restricted the authorities of the new president. This action was taken regardless of who the president might be. Yet there is a strong belief that it is taken to curb MB ambitions and power. Of course MB doesn’t like either. It says it won the elections. They even announced it just six hours after the close of the last election station while there were more than 8000 election stations still counting their ballots. This very early announcement brought more skepticism. Now what the negotiations between SCAF and MB will end up like, no one knows. But Egyptians really don’t want their country to turn into another Iran. Egyptians in Nasr City who were rallying for Shafiq and SCAF were draped in the Egyptian flag said that they would accept Mursi if he wins, but Islamists who are in Tahrir square wearing their shrouds as a symbol of readiness for death and martyrdom? ?, insist Mursi is the winner. I am so honored by your inclusion of me into the sacred circle of Egypt. Truly, it must be one of the most spiritual places on the planet. How can a people so full of innate grace and wisdom – not to mention the most wonderful sense of humor – enslave themselves to such tyranny? Sigh. Yet, like you, I believe that the energy and hope of the Revolution is not gone. Once having tasted sweet liberty, the youth will demand more. Look to the Light! Re rises victorious each day. It takes a country a little longer. Dear, Sandra, what a beautiful piece! I could feel that you are Egyptian through and through, not by possessing a little square piece of identity, but by your understanding and love of Egypt, which came across from your words. I didnâ€™t know that you have books on Egypt! Tell us what, and you will have one more dedicated reader! How true, and representative of many people, Egyptians and non-Egyptians, what you have said: â€œSCAF has a clear intention â€“ not to allow the Islamists to take over Egypt. I donâ€™t want the Islamists to take over Egypt. So I find myself in a strange camp with the enemy of my enemy who is also my enemy.â€ Egypt is doomed by its military and Islamists â€“ these two are the threat to her democracy and progress; and the Islamists more so. In the elections, we found ourselves left with a choice between a lesser and greater evil. I, and many other Egyptians, reluctantly voted for the military not because they were good, but because they were the only power that could check the power of the Islamists, Egyptâ€™s greatest evil, yesterday, now, and forever. How poor is eternal Egypt! Did Ahmose, Thumose and Ramses ever contemplate that she would come to such a wretched state? But we, you and us, as all who are interested in progress and justice, shall continue our struggle for a civilian, secular, democratic Egypt. But for this to succeed, I guess we shall need the Book of the Dead, not that sort of dead Mubarak is, but the “Book of emerging forth into the Light” â€“ we need a few magic spells to help Egyptâ€™s journey through Tuat (the underworld) â€“ where she really is in at the present â€“ and into a new life. I am with you all the way on your view & share in common that I began supporting the revolution Jan 28th, 2012 & #Pledged to stand with #Free #Egypt until victory is manifest, and that means a ling road ahead. I also share with you ” I am not Egyptian, but I have never been there & realize I have an American perspective so try to keep quiet & just support #FreedomFighters but sometimes with supporti.g I need to exercisr my #FreedomOfSpeech too, at least to vent.